It’s been a pretty packed week for me. I was supposed to post the Markki Stroem videos yesterday but was pressed for time. Nonetheless, I am so happy to have gotten the chance to see him perform right in front of me. 🙂 Apart from his good looks and evident charm, it was nice to get him to open up about his family, his college adventures and his music career. As most of you know, Markki was one of the toughest contenders on the ABS-CBN talent show “Pilipinas Got Talent”. He was up against the Ezra Band (who also performed on Stage 1 last week), Sherwin Baguion, Jovit Baldivino, The Velasco Brothers, Baguio Metamorphosis. Jeline Oliva, Luntayao Family Singers, Keith Clark Deleva, Alakim and Ruther Urquia. Although he didn’t win the title, Markki believes that PGT taught him a lot of lessons and opened many doors for him. Before his live performance on Stage 1, Markki came fresh from Baguio city where he performed for a DepEd event. 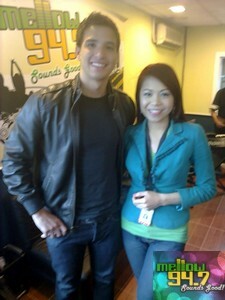 He’s also been busy touring with fellow PGT finalists to promote the compilation album Pinoy You Got It. To get full details of his gigs and appearances, you may visit Markki Stroem’s official Facebook page or follow him on Twitter. The videos below contain snippets of the interview and the songs he performed for us.